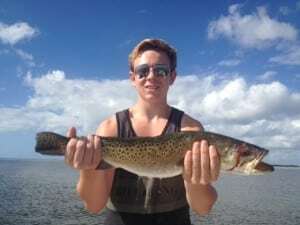 Our Fort Myers fishing report for the first week of February indicates the fishing is very good and getting better. As a Fort Myers fishing guide, fishing the flats of Pine Island Sound have proven to be quite productive in the last week or so. The good fishing has been very nice after some tough weeks due red tide and cool water temps. Now it seems, we have weathered the storm and things are back to normal. Last week I had several days with customers that were very good. We caught a high number of speckled sea trout while enjoying beautiful weather. Also as of late we have been catching some very nice sheepshead at some of the passes. We have been finding some nice Redfish in the marbled bottom areas of Pine Island Sound, where you have a mix of sand and grass.